MTV is sticking with The Shannara Chronicles. Today, the network announced they’ve renewed the fantasy series for a second season. The series stars Austin Butler, Ivana Baquero, and Poppy Drayton as an unlikely trio on a quest to destroy a demon army. Aaron Jakubenko, Daniel MacPherson, and John Rhys-Davies also star. Season one ended in March. Though season one received fairly low ratings, with an average of .40 in the 18-49 demo and 890,000 viewers, MTV has decided to renew the series based on its digital performance and creative merit. NEW YORK, NY – April 20, 2016 – MTV, a unit of Viacom (NASDAQ: VIAB, VIA), today announced it has renewed “The Shannara Chronicles,” its adaptation of the international best-selling fantasy novels by Terry Brooks, for a second season. The announcement was made ahead of the 2016 MTV Upfront presentation to be held in New York tomorrow. Developed at Sonar Entertainment, the series is co-produced by MTV, Sonar and Farah Films. The first season of “The Shannara Chronicles” averaged a 0.98 L3 rating in MTV’s core P12-34 demo and ranks as MTV’s top-rated new series this year. Additionally, “Shannara” saw the highest average L7 lift (+106%) for a freshman series in MTV history. 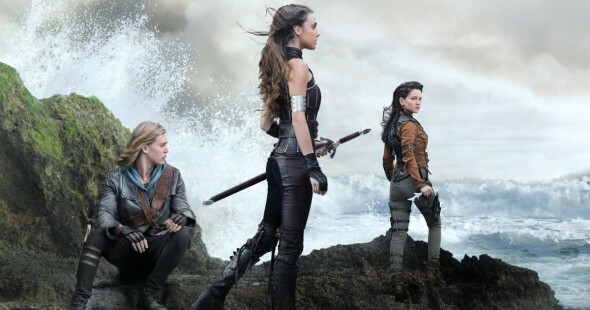 “The Shannara Chronicles” was also a strong performer on digital platforms, where it garnered 16.6 million streams across all MTV’s digital properties and brought significant traffic growth to the MTV App. The series also ranks as the highest grossing digital download for a single season on MTV ever. What do you think? Did you watch season one of The Shannara Chronicles? Will you watch season two? What do you hope happens? More about: MTV TV shows: canceled or renewed?, The Shannara Chronicles, The Shannara Chronicles: canceled or renewed? Hopefully, the next season the producer learned that having characters that look like they just stepped out of the shower all the time is not so realistic when they’re interacting with so much **** on screen. Wow it’s about time it’s coming back but a whole year later this month season 1 ended. I really loved this show a lot and the music too.. Great actors,great tv,thanks mtv great choice.. But what month is it coming back?? I do understand the actors are in other movies but I can’t wait!!!!! I have watched it this is my 3rd time through it on netflix lets go woth new season! Great news! Really Hot chicks that can actually act and great storyline have me definitely looking forward to a 2nd season. When will it be airing? As a fan of the Shannara novels, I was pleased to see the TV adaptation had similarities to the books and can’t wait to see what the following season brings. Great work MTV!!! I really look forward to season 2 ( and hopefully many more seasons to come )! MTV was smart in picking up this fantasy series. However, imho they need more episodes..bcuz, 10 is not enough (especially for the YA crowd). If they want this season to continue on and to get good ratings, they should go for 22 Episodes and split it throughout the year. It’s a fantastical ~☆~ beautiful show and, I think it could have all the success of the Vampire Diaries….. I really look forward to season 2 and hopefully many more seasons to come MTV was smart and picking up this fantasy series they need more episodes however 10 is not enough especially for the YA crowd. If they want this season to continue and to get good ratings they should go for 22 Episodes and split it throughout the year it’s a fantastical beautiful show I think it could have all the success of the Vampire Diaries….. I found the books boring, but I’m loving this show! Glad it got renewed! I watched this on Netflix. Very good, Suggested it to others. I plan on watching season 2 once on Netfix. I don’t have cable tv. Looking forward to season 2. Enjoyed season 1. Yes I am looking forward to a second season. The first one kept me guessing and I enjoyed it very much. Excellent choice with characters. I am hoping AmberLee is not gone for good. Will definitely watch. Very well done show. Hope they do more after 2nd season. It will be great if they find a way to bring back the female lead – she and Austin Butler were great together on screen.